The video has already garnered over 2k likes. 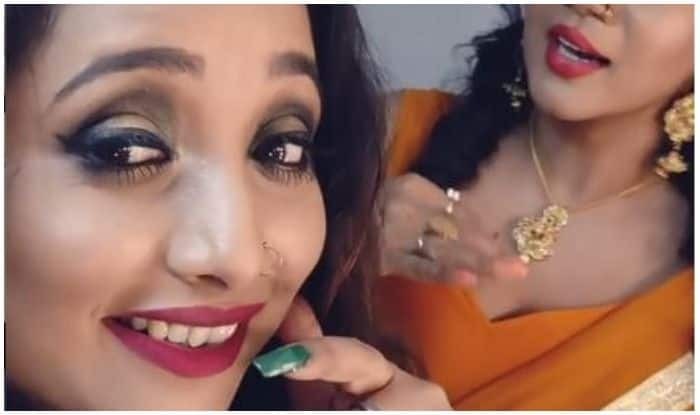 Bhojpuri bombshell Rani Chatterjee recently uploaded a video on her Instagram handle that gives us a glimpse of her fun and frolic life on the sets. Donning a heavy make-up, Rani speaks to the camera as she introduces Mumtaz, going all OMG the moment she sets her eyes on her. In the shared video, Rani is seen covering her mouth in disbelief to hype the drama as she tells her viewers that she just saw Mumtaz, the one from the song Aaj Kal Tere Mere Pyaar Ke Charche Har Zabaan Par when her co-actor Gunjan, dressed in typical yellow saree, comes in the frame and grooves dramatically to the old melody Jai Jai Shiva Shankar from the Rajesh Khanna and Mumtaz starrer Aap Ki Kasam. Gunjan can be seen donning Mumtaz’s look from the song as she shakes a leg while singing the lyrics along with Rani. Rani captioned the video as, “OMG KOI TO ROK LO (OMG! Someone make her stop!) #masti #lovemakeup #shooting #timepass” (sic). Rani Chatterjee has a huge fan following on social media, all thanks to her blockbuster hits and sultry dance numbers and the video has already garnered over 2k likes. Rani has wowed moviegoers with her performances in films. Her comic timing is impeccable and her antics are too adorable. She loves sharing such videos on Instagram to keep entertaining her fans. The Bhojpuri hotness has a Youtube channel named Rani Chatterjee Entertainment and is also quite active on Facebook. A fitness freak, Rani keeps sharing several workout videos on her social media handles. For the uninitiated, Rani ventured into the Bhojpuri film industry in 2004 with Sasura Bada Paisawala alongside Manoj Tiwari in the lead. Directed by Ajay Sinha, the movie not only turned out to be a blockbuster hit at the Box Office but was also the highest grossing Bhojpuri film that year. Famous for posting dance videos on her social media handles, Rani’s song Chalu Kar Generator from the film Ghayal Yodha garnered much love from fans. Bankrolled by Sunil Kumar, the song was directed by Bali and the music was composed by Madhukar Anand while the lyrics were penned down by Manoj Narayan. She also grooved to the beats of Sapna Choudhary’s Teri Aakhya Ka Yo Kajal which made her fans go into a frenzy. Rani will next be seen in films such as Ye Ishq Bada Bedardi Hai, Sakhi Ke Biyah, Chor Machye Shor, Rani Ki Hukumat, Jab Jab Khoon among others. She has also won hearts with her music video, I Love You which was sung by Kalpana Patowary.